The cool thing about a coaching search for your favorite football team is it tests what you as a coach, or fan, hold as your priorities for a coach. Generally, there are three types of coaches: The CEO type recruits well, sets the general culture of the program and delegates. A good CEO Coach hires coordinators they trust and then delegates the Xs and Os from a day to day perspective. They have a general vision of what they want (up-tempo offense, 3-4 defense, etc.) and hire coaches who can execute it. For example, Les Miles was the quintessential CEO Coach. Second is the Head Coach Coordinator, who is interested in the Xs and Os on one side of the ball. They are usually pretty good as a coordinator (or else they would not be considered) but this does not mean they will translate well to being a Head Coach. (Peter principle) Will Muschamp is the perfect example of this on the defensive side of the ball (see his time at Florida) and Oregon’s Mark Helfrich is a good example of this as an Offensive Coordinator. P.J. Fleck of Western Michigan. The third is the most elusive. They are the ones that excel both as CEOs and Head Coordinators, and this combination usually leads to National Championships. Nick Saban, Urban Meyer and Pete Carroll (see USC days) are the short list of coaches that are both types in one in today’s college football. Oregon currently has a Head Coach opening and, anytime a program hires a new coach it is crucial decision. The two candidates I am looking at today are P.J. 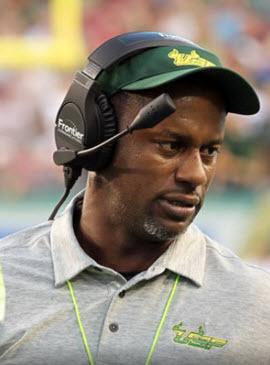 Fleck of Western Michigan Broncos and Willie Taggart of South Florida Bulls. Both have been at their respective schools for the past four years and both have had their best records this past season. First, P.J. 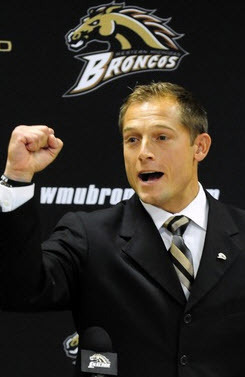 Fleck is a CEO type with no coordinator experience (similar path as Urban Meyer). He is a ball of energy that will give his program everything he has, leaving no stone unturned. He is a rah-rah motivator to the extreme. I watched his team play against Toledo and Ohio and I was impressed with the discipline and efficiency they played with offensively. P.J. Fleck fires them up! This showed up on film as well, against Toledo, and an example would be in the first quarter (9:32 left) where it was third and six and Western Michigan had a nice completion to keep the drive alive. Then in the next set of downs the QB scrambles on a third and eight for the first down again. On the same drive it is yet another third down (and three with 5:21 left in the first quarter) and the offense gets set, looks to the sideline and RB dives for the touchdown. Defensively, they allowed a lot of big plays and points but the three turnovers they generated were the difference in the game since they won by three scores against Toledo. On the year they ranked 69th yards per play given up, and for a comparison Oregon ranked 114th in the country. 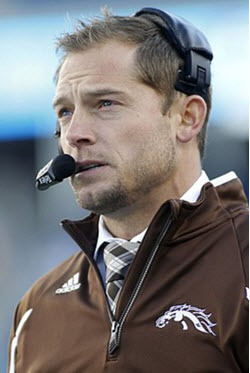 Fleck’s team plays hard and they want to control the ball on offense. Not from the standpoint of three yards and cloud of dust, but more of what is the defense giving us and what play can we execute to get positive yards. The poor defense, however, is concerning–especially given the length of time the offense controls the ball and Oregon’s woes defensively this season. If I were the AD interviewing, I would need a very good plan on how the next coach will dramatically improve the defense, specifically concerning a non-defensive coaching candidate. 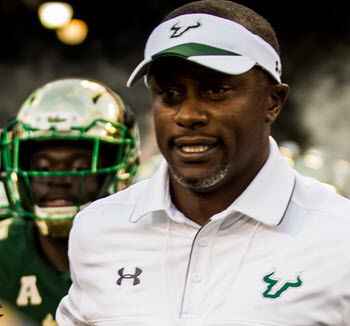 Next candidate is Willie Taggart. He has a little more coordinator experience, one more year than Fleck, and he is similar to a CEO type as well. He comes from the Harbaugh coaching tree where he played and coached under Jack and Jim Harbaugh at Western Kentucky. There is a great coaching commentary video with Taggart and four other coaches on the 2015 National Championship game. You get a feel for his personality and the way he sees the game in the video above. Offensively, Taggart switched philosophies from the ball-control, Stanford style offense that Oregon fans are familiar with, to a wide-open, four receiver spread offense that is very similar to Oregon’s offense. They ranked 5th in the nation in yards per play this season, which is better than both Western Michigan and Oregon. In their very first play of the game against Florida State you would have noted South Florida coming out in a double stack wide receiver look on each side of the line of scrimmage with a running back, which is a formation Oregon runs often. The Bulls executed a faked a screen and threw it to the WR for an 84 yards touchdown to start the game! South Florida would end up losing that day, mostly because they could not stop the running attack of the Seminoles (478 rushing yards by Florida State). This is also reflected in their 73rd defensive yards per play ranking. Once again, there seems to be another coach with a high-octane offense paired with a deficient defense. I used the yards per play statistic because all four of the playoff teams this year are in the top 6 defensively for yards per play–something Oregon needs a lot of help with if they want to make it back to winning football. Overall, I would consider both coaches CEO types with impressive results this season. Both current records of these coaches reflect the results of the work they began four years ago when they first arrived at their schools. Most importantly, Oregon needs a coach to restart their culture. It went from Chip Kelly’s “Win the Day” to I-am-not-sure-what-Helfrich’s-philosophy-was, and I am not sure the players did either, which the results on the field showed. Both these coaches show the ability to convince their players of their vision and the team values, thus both would be excellent Head Coaching candidates for the University of Oregon.